During this new season of my life, night time is a whole different adventure. With the anti-estrogen meds I’m taking as part of my breast cancer treatment, I now set the air conditioner to Eskimo, and then several times during the night I wake up to find myself in a tropical rainforest! But I know that the meds have a valuable purpose so, much as I wish it were different, I need to just accept this season with as much grace as I can muster. Sometimes it’s with praise and thanksgiving, and sometimes it’s not! I’ve found that the same thing is true when God sends us into a new spiritual season. We don’t always like it, but He’s not going to let us get into any ruts in our relationship with Him. Once we get comfortable relating to Him one way, He sends us into a new spiritual season. In my latest season with the Lord, sometimes I’ve felt like I’m on airplane mode. For stretches of time, I haven’t been able to send or receive any spiritual words! During this “wordless season”, sometimes reading scripture has become like eating cardboard, and about the only prayer I can come up with is “help Lord”! It wasn’t until I started writing this blog that the Lord began to let some carefully chosen words come back into my spiritual life. But during this deep void in my spiritual life, God opened a new door for me with painting. After retiring from my law practice, on a whim I went to a watercolor painting class. I hadn’t painted since 7th grade art class! The teacher was a lovely woman who made it really easy, supplied all the materials and provided simple but fun ideas of what to paint. Turns out I really love it and I’ve been taking classes and painting now for about 3 years. To my great surprise, I’ve found that there is a spiritual component to my painting that God uses to touch other people. A friend was at my house when I was working on the simple painting attached to this blog. And she got tears in her eyes! She said later that it was a prophetic word for her about the dark season she would be going through – golden fields below, blue skies above, and then deep blackness covering everything. (She also points to the small white heart that I hadn’t even noticed, as showing her God’s love was with her during the darkness.). I’ve also found that the paintings can sometime have an impact on friends who aren’t Christians in a way that words can’t. One dear friend, who has been deeply hurt by people describing themselves as Christians, has an immediate spiritual reaction when there is an anointing on one of my paintings. 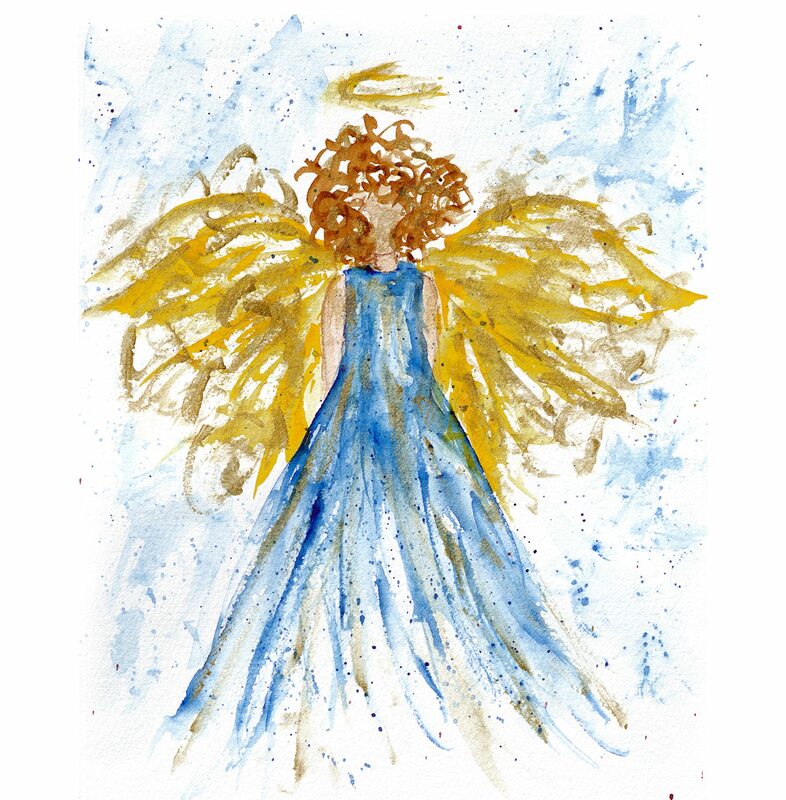 I gave her one of my angel paintings and she sent me this poem – “your sparkling JOY Angel adds joy to my flow…She graces my space with beautiful charm … that wraps me in God’s sweet & strong gentle arms”. We know from Romans 8:28, “all things work together for good for those who love the Lord and are called according to His purpose”. So during even our darkest seasons and greatest challenges, God is at work to bring about blessings to us and the people around us. Take courage! You’ve been part of my spiritual journey for many years now! Thank you for the inspiration and example you give me! You’ve been such an encourager to me!